Google Earth has launched an interactive 3D moon atlas to celebrate the fortieth anniversary of the Apollo landings. Now we can all play at being Neil Armstrong and take a (virtual) trip to the moon to have a good nosey around using Google Earth's magnificent 3D atlas. "Forty years ago, two human beings walked on the moon," said Moon in Google Earth Product Manager, Michael Weiss-Malik. "Starting today, with Moon in Google Earth, it's now possible for anyone to follow in their footsteps. We're giving hundreds of millions of people around the world unprecedented access to an interactive 3D presentation of the Apollo missions." 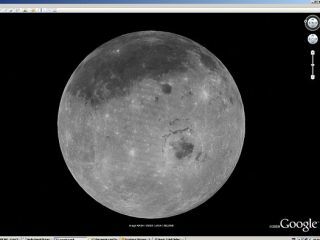 You can visit Moon in Google Earth today and take a trip across the 'virtual Moonscape' by simply updating to Google Earth 5.0. Astronauts Buzz Aldrin (Apollo 11) and Jack Schmitt (Apollo 17) also appear to give you their very own accounts of their legendary journeys into space and guide you around the landing sites of the Apollo missions 11-17. "Today's announcement builds on the ongoing relationship with Google that Ames Research Center initiated in November 2006 when we signed a Space Act Agreement to foster collaboration with our Silicon Valley neighbor," said S. Pete Worden, Director of Nasa Ames Research Center in California. "We're excited to be a part of this latest chapter in Google's efforts to bring virtual exploration of the Moon to anyone with a computer." For more Moon-based fun and games head over to Google Moon right now.